Rinske Douna is an extremely gifted artist with videos on Youtube where she generously shares paint pour techniques used for her stunning artwork. There are many paint pour projects on Youtube but The Dutch Pour tutorial caught my eye because unlike many paint pour instructions, you don’t need to mix a medium with the acrylic paint. The artist just uses water. The other unusual element of her technique is to use a hair dryer to blast paint across the canvas. Her results are awesome. I planned a different look for my project, which included a large double canvas and silicone lubricant to create a variety of cells. Nevertheless, I decided to give Rinske’s technique a try, combining her steps and mine, so I could share my experience with you. You might want to check out Rinske’s short, Dutch Pour Video before reading my tutorial. I wasn’t able to take photos as I worked with the hair dryer in steps 11 and 12 but Rinske’s video demonstrates this clearly. Rinske mentions that she likes to work with small canvases. After tackling my two 12” x 24” canvases I understand completely. Much more paint is needed for large canvases and the quantity of paint to water ratio had to be given a lot of consideration in order for the hair dryer to move paint across such an expansive surface. 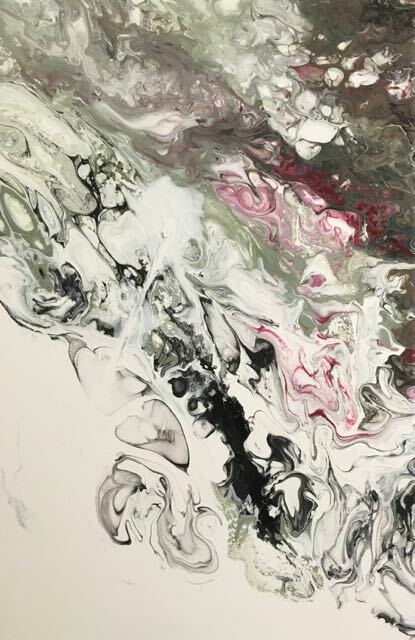 No details were included for how much water to mix with the paint in Rinske’s video but she does show how the paint should drip off the mixing stick. This is a very helpful visual. She also warns that not all paint colors will require the same amount of water. That’s true. My black paint needed a lot less water than my sage green paint. I wanted an idea of where to start when adding water to my paint so I experimented. I found that a 50/50 mix was generally too much water. I started pouring paint in transparent plastic cups then adding water. It allowed me to see the ratio of paint to water because the water sits on top of the paint. I concluded that less than 50/50 - about 2 parts paint, to one part water, worked for most paint colors. I filled all the color cups this way then added more water or paint when necessary to individual colors. Stir the paints thoroughly. Tilt the cup to be sure there are no clumps toward the bottom. Some colors take time to break down in the water. Don’t rush the stirring step. I added four drops of silicone lubricant each to the black, wine, and smoke paint cups. Wear disposable gloves for this project and work on a large protected surface. step 1 - For a clean canvas back, tape the edges. Use extra large pushpins in each corner to keep the canvas level. A crooked canvas will cause paint to shift, possibly in unwanted ways. step 2 - Pour your paint colors then water into transparent plastic cups and stir thoroughly. The water sits on top of the paint allowing you to see how much of each you are using. Add three or four drops of silicone lubricant to each color to create cells in the finished art. step 3 - Mix white paint with water in a large squeeze bottle. Apply it to the edges and center of both canvases. Tilt the canvases to cover the surface. Use a gloved finger to add paint to the sides. step 4 - Wave a kitchen torch across the paint surface to pop bubbles. Also do this after pouring each paint color. step 5 - Align the canvases side by side to create one continuous painted image. step 6 - Pour the sage paint into a puddle in the lower right half of the right canvas. Continue to pour slightly left of the line where the canvases meet. step 7 - Add less of the smoke color to avoid an overly dark canvas. step 8 - Add a couple of streaks of the wine paint across the puddle. step 9 - Pour a bit of black to the right of the puddle. step 10 - Generously outline the colors with white paint from the squeeze bottle. step 12 - Now for the fun. Blow the paint from the lower right to the upper left with long strokes. If you find the paint is not fluid enough, pour on more white or another color and blow again. 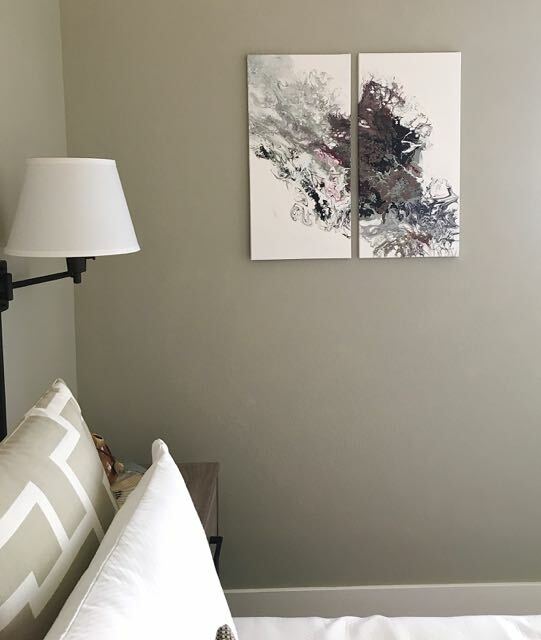 I wanted a lot of white space on my canvas and a diagonal design, but you can create your own art by pointing the hair dryer and moving the paint in any direction. step 13 - Do not move the canvases until they are completely dry. This may take 24 hours or more. Remove the pushpins and the tape. If the paint is not flowing freely across the canvas, it is either too thick, or you have not applied enough paint to the canvas. This process takes a good deal of paint. I used a dryer with hot air, which did not seem to negatively affect the paint surface. Be sure to use a narrow concentrator attachment. Before pouring paint, plan how much of each color you will use. Decide which should be dominant. For instance, if you want a result with Smoke being the prominent color, pour more of that color than others. Unless you want a strong dark canvas, err on the side of very little dark paint. You can always add a bit more and blow it across the canvas to mix with the other colors.